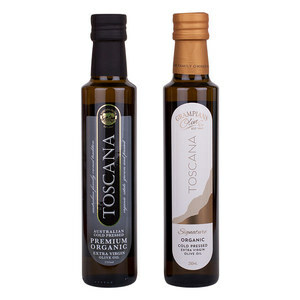 Australian Organic Extra Virgin Olive Oil - Toscana Grampians Olive Co. Established in 1943 and 100% family owned and operated, we are one of Australia's oldest olive groves. Heritage trees, dryland organic farming, a Mediterranean growing climate and a passion for quality combine to create our olive oils. We are the Grampians’ leading olive producer, renowned for producing some of the best organic olive oil in Australia. View our awards, discover more about our grove history and production of our Australian olive oil. Wanting to reflect the beauty of the unique Grampians location in which our products are grown and produced, Grampians Olive Co. is a throwback to the original name from 1943 "Grampian Olive Plantations Co." The new look combines our two brands (Toscana & Grampians Olive Estate) reconnects with our roots and better communicates the origin of our products. Read more. Our family’s philosophy for producing olive oil is quality over quantity. We have established a reputation as one of Australia's best producers of premium quality organic extra virgin olive oil - consistently producing award winning olive oils of exceptional quality and perfectly balanced flavours.